Focus on Fauna gets REAL! Focus on Fauna recently teamed up with Michigan State University’s Remote Environmental Assessment Laboratory (REAL) to analyse some of the bird/frog audio files recorded by our remote Song Meter during surveys on private properties around Flowerdale/Strath Creek last year (click on Project Activities for a description and photos of the Song Meter). Jo Wood from the Goulburn Broken Catchment Management Authority instigated the contact with Professor Stuart Gage at MSU; Jo was previously involved in a joint project with Stuart to analyse frog recordings at Tahbilk Lagoon near Nagambie. 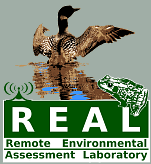 Stuart and his team at REAL specialise in “soundscape ecology”. Soundscape is a term for all the diverse sounds that emanate from a landscape, including biological, geophysical (wind, running water, thunder etc.) and anthropogenic (planes, vehicles, air-conditioners etc.) sounds. Biophony (biological sound sources) can be influenced by other sound sources; an example being birds that alter the loudness or frequency of their calls in urban environments to compensate for traffic noise. Frogs, birds and insects often cease calling when it is windy or raining heavily, and excessive background noise can disrupt frogs from finding mates. Here Stuart has analysed dawn chorus recordings from 11 Flowerdale/Strath Creek properties and assigned a “normalised differential sound index” (NDSI), which attempts to quantify the soundscape of each survey site. Jo has emphasised that the index does not necessarily reflect the conservation value or management practices of each property, since it can be influenced by factors beyond the control of the landholder; however it can give us an idea of what is present, and the diversity at a site. Also at this stage the analysis is based on only a single one-hour dawn recording for each of the Focus on Fauna sites. To access the sound recordings, click on ACCESS DATA and then SEARCH. For an explanation of soundscape interpretation, go to the HOME page. ← Not just trees for this bird ! congratulations on getting REAL. It is great to be teamed up with a university in USA. I am sure they didn’t know where Strath Creek was either! Hope our bat sounds get analysed as well.